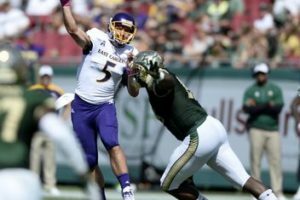 Who are the leaders in the race for the 2018 Heisman Trophy? He’s suffering from the team being so underwhelming. 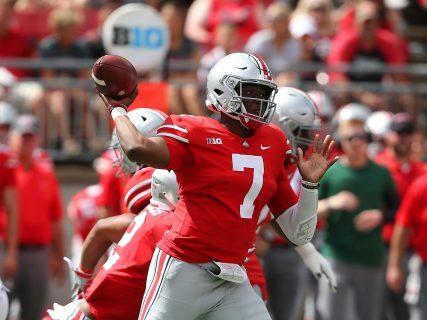 The Buckeyes might not be doing anything amazing – other than getting to 9-1 and being deep in the hunt for the Big Ten Championship and the College Football Playoff – but Haskins continues to be amazing. Ho-hum. He just dealt with one of the nation’s top defenses and threw for 227 yards and a score in the win over Michigan State. The key was not screwing up. The Spartans needed Buckeye mistakes to pull off the win, and they didn’t come. Even after failing to hit 300 yards in either of the last two games, Haskins is still third in the nation in total passing yards, throwing for 3,280 with 33 touchdowns and six touchdowns. If he’s able to blow through Maryland, Michigan, and Northwestern for a Big Ten title, he’s going to New York. This might be the season of Tua and Kyler, but Tagovailoa’s Heisman stock might be falling a wee bit because of his knee injury, and Grier is getting at least one shot at Murray to make his statement. Third in the nation in passing efficiency, it’s not even close. He’s on an island, currently way ahead of Notre Dame’s Ian Book, and behind Tagovailoa, completing 69% of his throws for 329 yards per game with 31 touchdowns and eight picks. Not only does he have his signature moment – the finish against Texas – but he’s having his best run of the season when the team needs him the most. 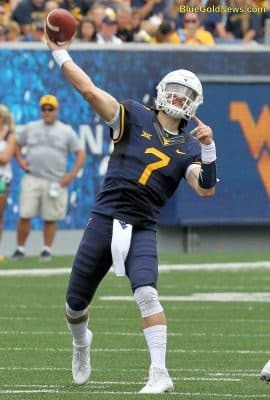 Since the loss to Iowa State, he has cranked out three touchdown passes in each of the last three games, with well over 1,000 yards and just one pick. And here go with the stat-sheet fillers with Oklahoma State and Oklahoma up next. Win those two, get to the Big 12 Championship, and earn a spot among the Heisman finalists. The one big knock is that no one outside of the Pac-12 world is seeing him play. That’s a shame considering he’s the nation’s leading passer by a mile. Ole Miss QB Jordan Ta’amu is averaging 337.4 yards per game. Alan Bowman of Texas Tech is averaging 329.8, and West Virginia’s Will Grier is averaging 329. Minshew? 385.2 yards per game. Since 2010, only four quarterbacks finished a season averaging more yards per game. Houston’s Case Keenum in 2011, Fresno State’s Derek Carr in 2013, Connor Halliday for Wazzu in 2014, and some Patrick Mahomes guy for Texas Tech in 2016. Brilliant, the 319 yards he threw for in the opener against Wyoming represented the low mark for the season. On the year, he’s hitting 70% of his passes for 3,852 yards and 29 touchdowns with seven picks. Best of all, Wazzu keeps on winning. On a six-game run since the loss to USC, the Cougars are just two wins away – Arizona and Washington – from playing for the Pac-12 title.